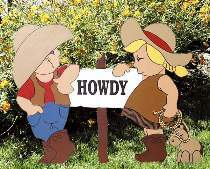 A real western greeting sign for your front yard. Easy to cut from 1/2" plywood. Project measures 26"L x 21"H. Pattern drawn FULL SIZE.